The new artwork: Did we mention they like black? 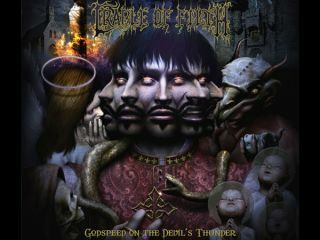 Black-inspired heavy metallers Cradle Of Filth are giving fans the first taste of upcoming album Godspeed On The Devil's Thunder. From 12.01am GMT tomorrow (27 August), you'll have 24 hours to stream brand new track Tragic kingdom, courtesy of the band's label Roadrunner Records. "The album is conceptual and is based on the well-documented, true-life fall from grace of a shadowy historical figure named Gilles de Rais, a wealthy French nobleman who was one of Joan of Arc's brothers-in-arms. He was best known, however, as a prolific serial killer who mixed prayers with his nightly murders as well as an aspiring alchemist. He was accused of a panoply of crimes, among them heresy, demonology and kidnapping". Stream Tragic Kingdom from tomorrow.